1. Cut designer Text paper to 4 x 5.25 inches. 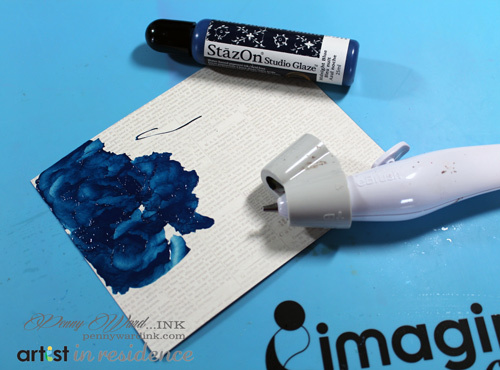 Squirt a pea size dollop of StazOn Studio Glaze in Midnight Blue in upper left corner, then blow the glaze around with an eBrush. Continue until desired effect. 2. 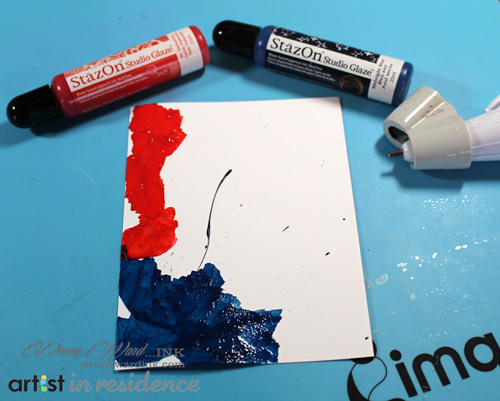 Add StazOn Studio Glaze in St. Valentine in the same manner, blowing across the cardstock to represent stripes. Let dry. 3. Die cut sentiment from panel. Die cut sentiment three more times from red cardstock. Stack and glue together leaving the red and white die cut on top. Die cut Stitched Star and ink with Delicata Golden Glitz. Let dry. 4. Assemble card by trimming white cardstock 4.25 x 11 inches, fold in half to form card base. Adhere flag panel with favorite glue. Adhere sentiment back into place. 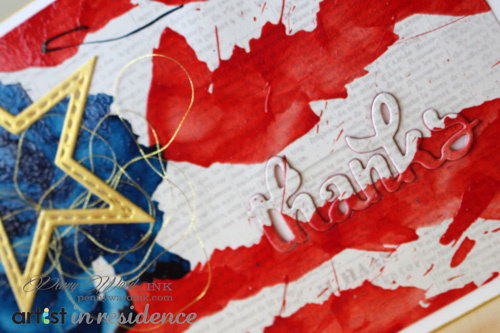 Add gold star into upper left corner with metallic gold thread behind it. Run edges of base card along the Delicata Golden Glitz ink pad for a shimmery effect. Miscellaneous: White cardstock, Glue of choice, Gold Metallic thread.